One of the earliest forms of patchwork, the four-patch block involves joining 4 squares of material to form a larger square. In it's simplest form, the block is constructed of 4 plain squares of fabric. The four-patch also lends itself easily to endless variation because each of the 4 squares may also be made up of numerous smaller pieces pieced together. One such variation is the Double Four-Patch. The 4 squares that make up this block are each made up of smaller four-patch blocks. A quilt top made of Four-Patch blocks, whether basic or complex, may vary from the very simple to extremely complex, both in the geometry as well as the color-play. 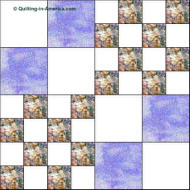 Because of its simplicity and versatility, Four-Patch designs are very popular with Amish quilters. While the Four-Patch is a very simple block, it is also a "block type" that describes the style of the construction. 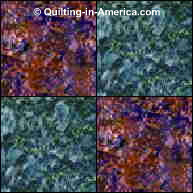 There are many, probably more than any other type, of Four-Patch style quilt blocks. Make this easy 4-Patch with a modern twist. Bright colors, lots of white space.